Summer's gone and Fall has arrived! Instead of outlining this past month, I thought I would breifly describe our month through pictures (thanks to Abby for the idea). It's part-time and I'm really enjoying it! Looking forward to a wonderful (and busy) October! Unfortunately, Summer is coming to an end! I've really enjoyed this summer, even though it's been a mild one (weather-wise). We've been busy with regional events, traveling, youth camp, seeing friends and family and girls jamboree. Also, our church began meeting on Sundays at a nearby hotel banquet room. Many exciting things are going on around here! In August, Matthew and I were able to get away for a few days to see some friends in St. Louis, MO. During the first part of the trip we stayed with Brittany and Jeff and were able to hang out, go to Brittany's baby shower for Macy, go to Twin Rivers and spend some time with their family. We had such a wonderful time! During that same trip, Autumn and J.R. had to come to town for business, so we met up with them downtown STL and stayed at the Hyatt. It was incredible - we stayed right across from the Arch. We enjoyed some fine cuisine...Charlie Gitto's on The Hill, Ruth's Chris, and Chick-Fil-A!! Autumn and I had a lot of fun catching up and shopping. It was a trip to remember! Since we've lived in Omaha, Matthew and I have had the opportunity to travel quite a bit and through those trips we are able to make the most of our time and even extend our trips by a few days to see friends along the way. Our perspective on "a long trip" has changed! Now, a 6 hour trip in the car is a breeze! I'm so thankful for our friends! Just a week ago (last weekend), we had a regional girls jamboree - "The Princess in You" was the theme and the girls had a blast! They dressed up, made shirts, got their hair and nails done at the salon and we also had a few sessions with a guest speaker, Kari. I'm so glad she was able to come and we were able to get to know her - she did a great job! As August comes to a close, I'm so thankful for the wonderful Summer we've had and I'm looking forward to fabulous fall! Summer is certainly flying by! It seems like we just celebrated Memorial Day and now we're in the middle of JULY! Matthew and I have been fairly busy with summer events for our denomination. At the beginning of June, we had our regional camp meeting (actually two - English and Spanish) and were able to worship and fellowship with ministers, pastors, and members in IA/NE. It was wonderful to see eveyone and those who travelled to Nebraska to be our guests. 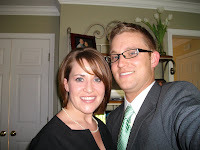 On June 9, Matthew and I celebrated our second anniversary with a trip to Melting Pot (YUM!) and a movie. We had a wonderful anniversary. We were also able to go to a College World Series game - Game 2 (LSU/UVA). It was truly an experience! As the month continued, we were preparing for summer camp (July) and for our trip to South Carolina. While there, we spent time with Matthew's family, as well as my family. We had a wonderful time and were able to celebrate Matthew passing his test for Ordained Bishop, the Church of God's highest rank of credentialed ministers. I am so proud of my husband! Our trip was truly refreshing and wonderful. It was great to see friends that we haven't seen in a while, too. Once we got home, it was Youth Camp prep time! Our region had youth camp July 6-10 at a 4-H Camp in Iowa. We had a blast and I know the kids' lives were changed. Two of our friends. Scottie (senior camp) and Derrick (junior camp) from South Carolina, came to speak to the two camps we were holding and both did an incredible job connecting with our youth and bring the Word of God to them. Now, Matthew and I are recovering from youth camp (haha!) and enjoying the summer. We have a few more events for the summer that we're looking forward to! The weather in Nebraska during this season can vary - storms, tornadoes, hot, humid and even cool. I love the weather right now - it's been in the low to mid 80's with little to no humidity! I don't want SUMMER to end! About a month ago I noticed that my engagement ring had a rough place on one of its prongs. My ring has a setting with several prongs grouped together, which was part of its appeal to me. I felt that my diamond would always be safe and protected. I was more careful with my ring, and even talked to Matthew about taking it to a jewelry store. I took it to a goldsmith about a week later. He was trying to fix the prong that had been bent. During this process, the entire “head” (prongs and diamond) popped off. He was shocked, I was shocked and Matthew was definitely shocked. After I made a few calls, I found that there was a store in Omaha that was owned by the store where Matthew bought my ring. Thankful for this new information (I had called the store in TN to ask if they had a store near us, they said, “no”) I took the ring to the store – right away! They were very helpful and were quick to action. Although I didn’t want to leave my ring there, I knew that it needed to be fixed and because of this, I could be without it for a few days. Until it was fixed, I continually looked down at my hand and even though I was wearing my wedding band, it just didn’t feel right. As our second wedding anniversary approaches (June 9), I am reminded of that sacred covenant we made with one another. Through this process with my ring, I have become more aware of the symbolism it holds. I want to protect my marriage so it will be strong and stand the test of time. I am so thankful for the gift that God brought into my life when he allowed my path to cross Matthew’s. HAPPY ANNIVERSARY, MATTHEW! I LOVE YOU! It seems like everywhere I turn, I see flowers blooming. Wal-Mart, Lowe’s and local nurseries seem to be selling flowers and potting soil and having sales to promote them. It’s spring and along with the season comes new growth. The first time I heard the phrase, “Bloom where you’re planted” was from my stepmother, Susan. This was the theme for her Ladies Brunch on Mother’s Day. Since then, I’ve heard it again – at our regional women’s conference and retreat, which was a couple weekends ago. It stirred me the first time I heard it, but it’s been on my mind again since hearing it again. More than ever, I want to bloom where I’m planted. I want to thrive and grow because I know there is a place for each of us to do what The Lord has called us to do. Are you blooming where He’s planted you? Growing up, my mom was "Mrs. Church Event Organizer Extraordinaire" and I recall one mother/daughter banquet in particular where everyone wore hats and the theme was "Hats Off To Mom". She was always thinking up catchy themes with exciting decorations. Everyone in attendance was to sport a hat. She always told me, "You can decorate any room (cheap) with balloons." I used that tidbit in some of my shower decorating and they do brighten a room. I guess I'm posting this to honor all the women in my life who have impacted me; whether they realized it or not. I have so many incredible women in my life who continue to teach me about life, marriage, love and happiness. I am thankful for a wonderful mother who left a wonderful legacy for me. She also loved me even when I was being a brat and taught me how to be a lady and preacher's wife without even knowing that I was learning those things. 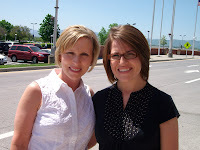 Susan, my stepmother, has become such a wonderful confidant in my life and someone I love dearly. 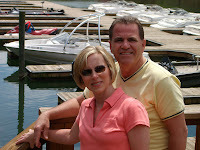 The Lord brought an incredible Mother-in-law (love) into my life and she has treated me as one of her own. My aunts, cousins, grandmothers, and my sister-in-law also set the right example for me, while loving and supporting me. I can't even begin to name the additional women (one by one) who have impacted me, but I strive to never let an opportunity to thank them and tell them what they mean to me pass by. So, I’ve been asked to update my blog because it’s been a while since I’ve written anything. This is for you, Em! I think (fingers crossed) that Spring has sprung in Omaha! We’ve waited for it to arrive and are so glad it’s finally here. It’s exciting to experience seasons for the first time in a new place. I’m even thinking of planting some flowers this weekend. I’ve already asked my dad which plants would be considered low-maintenance and easy to grow in pots or hanging plants (I didn’t inherit his green thumb). Matthew and I have been doing more of the same since my last post. He’s been preaching and we’ve been traveling. He had been studying for his Ordained Bishop’s test and I can proudly report that he PASSED! This was our third Winterfest event of the season. We stayed with my aunt and uncle and see several family members (including dad, Susan, Josh and Shannon, aunts, uncles and grandparents). Autumn and JR were even able to come to Knoxville for a short visit. We have wonderful friends who let us crash at their house when we're driving through! We stayed in IL with Jenn and Chad on the way to TN. 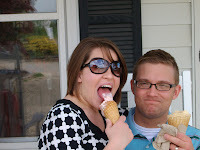 On the way back to NE, we got to be the first houseguests of Brittany and Jeff! We had a wonderful day with great friends! Driven is a great group of teens/young adults that we are honored to ministered with at churches in our region. We were so happy to be able to celebrate with the church family. The church started in a borrowed cabin and is still thriving today. Matthew and I were able to spend a few extra days with Dad and Susan. 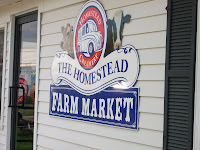 We had a blast eating Homestead Creamery, going to the lake, grilling out and eating on the porch for all of our meals (thank you, 90 degree weather in APRIL!). Matthew was even put to work – he and Dad helped a family move! There were probably more events that I'm forgetting! Currently, we’re gearing up for a number of state/regional events. It’s going to be a busy summer! We are looking forward to our first youth camp in the Midlands Region. 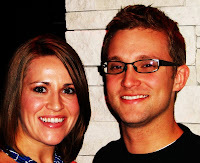 I am the wife of a minister and we just moved to Nebraska to plant a church and work in the Regional Office. I am excited about the adventure and path that we believe the Lord has taken us on. I love spending time with family and friends and miss them so much. I usually have 2-3 ‘to do’ lists going at the same time, but I’m working on that. Matthew is a fan of the Georgia Bulldogs (me too!) and enjoys watching football. His other interests are politics and current events.